I wish I could spend the summer somewhere that overlooks the water, with a cool breeze blowing and a cocktail in my hand. It’s a nice fantasy, but I have a full-time job that doesn’t offer this as a possibility. 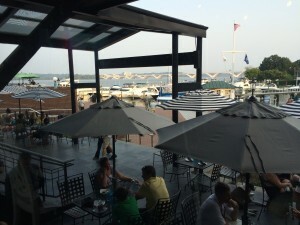 One evening at the new Blackwall Hitch in Old Town Alexandria isn’t a substitute, but it does give me a chance to enjoy the view and fantasize that I’m somewhere far, far away. 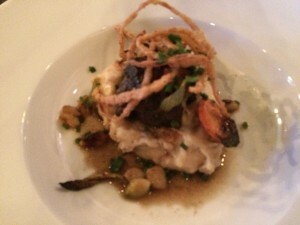 A recent media dinner at Blackwall Hitch provides me the opportunity to sample a range of menu items including antipasto chopped salad, crispy soft shell crab, Diver scallops, braised beef short ribs, and apple dumplings. 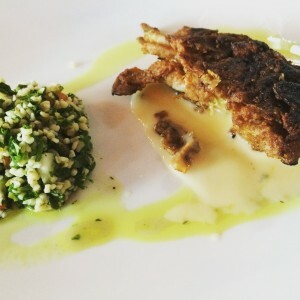 The menu is an extensive mix of casual fare including salads, burgers, and flatbreads, along with more substantial offerings focused heavily on seafood to match the nautical theme of the restaurant. Blackwall Hitch is the result of an impressive conversion of the food court located next to the Torpedo Factory. The name comes from a special sailor’s knot used to attach a boat to the dock. 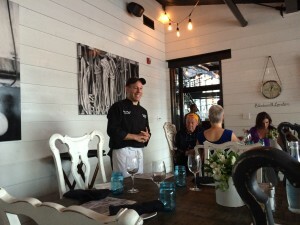 Playing on the theme, the restaurant encourages customers to make their own connections with the food and setting. Many of the cocktail selections feature blends with fruit and citrus. Watermelon saketini is a refreshing summer beverage with watermelon puree, sake, mint and lime juice. Chef Michael Wagner’s menu showcases fresh local seafood, which means there are a variety of crab dishes and an oyster bar to be enjoyed. Short ribs are tender and tasty, served with mashed potatoes and topped with crispy onions. The dish may be better suited to a cooler night, but that may require giving up a chance to enjoy one of the enticing decks that give this restaurant its unique vantage point. If your summer is short on waterside views and you’re in the Old Town area, give yourself a staycation with food, libations, and fun at the lively Blackwall Hitch.